We have two farms in the Catskills, where we host beautiful farm weddings and grow produce and raise animals for our group. Blenheim Hill Farm, is an historic farm where heritage breed, free roaming animals are bred and raised, and a year-round hydroponic greenhouse supplies fresh, seasonal greens for the Blenheim restaurant. Seven Ponds Farm is a heavenly spot for more intimate weddings. It is located about 30 minutes from Blenheim Hill Farm. Historic structures of the property have been preserved and restored by the owners. 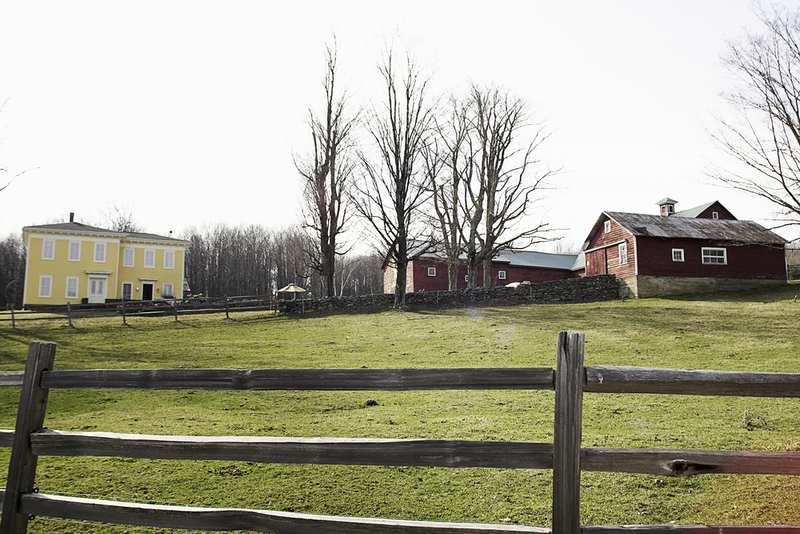 Did you know that you can celebrate your wedding at Blenheim's beautiful farm in the Catskills. Click here to go to our farm's website to get information about our weddings. Both farms lie high up in the Catskills mountains. The history of the Blenheim dates back to the late 1700's, when the Peaslee family settled on the land that was then owned by the Queen of England. Parcels of the land were divided and leased to farmers until the Anti-Rent War on Blenheim Hill, and the town was also the site of various raids and skirmishes during the American Revolution. The land operated as a farm until the 1970's and laid dormant until 2010, when proprietors Morten Sohlberg and Min Ye purchased the farm and restored the property. Seven Ponds Farm also have a rich history, it was founded by one of the lead engineers who built the Brooklyn Bridge in NYC. George Lape worked closely with the Roebling’s on the design of this historic landmark. Owner Morten with a family of heritage breed pigs at the farm. Since the farm's restoration, Blenheim Hill Farm has blossomed into a site where traditional farming methods meet the modern tenets of sustainability. Rare and heritage breeds of livestock and poultry, including Icelandic sheep, Hereford beef cattle, rare breeds of pig and free-range chickens, roam the land and forests. A state-of-the-art hydroponic greenhouse, designed by owners Morten and Min, houses year-round varietals of edible flowers, herbs, peas, beans, barley, cucumbers, heirloom tomatoes and more. Forests of maple and birch trees line the outskirts of the property and bees are kept to produce local honey. A two acre spring-fed lake supplies fresh water for the animals, and local butchers are used to prepare and cure the meats for all restaurants. Owners Morten and Min split their time between managing their restaurants in Manhattan and running the farm upstate.